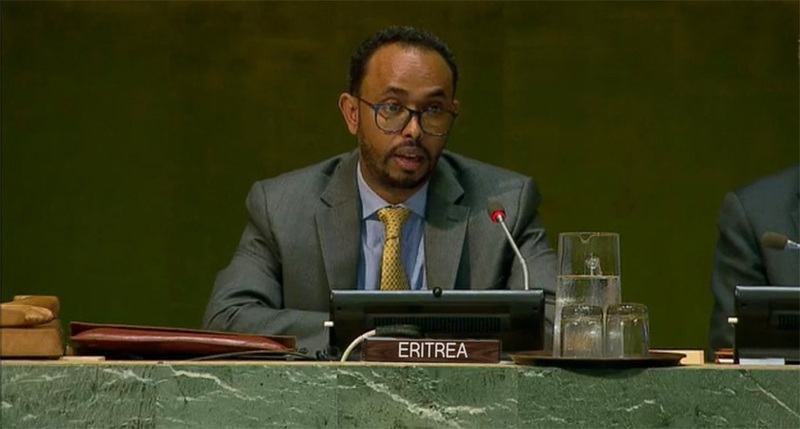 Statement delivered by Mr. Nebil Said, Counsellor, Permanent Mission of Eritrea, at the Third Committee of the 73rd Session of the United Nations General Assembly under Agenda Item 74, subitem: Promotion and Protection of Human Rights in New York on 24 October 2018. The take away from the discussion is that the promotion of human rights for all remains a challenging task for every nation; and, that international partnership in addressing issues of human rights is best served by constructive dialogue and, not through politicization, double standard, and stigmatization. Peace and security, development, and human rights are three critical pillars of the work of the United Nations, each having an impact on the other. The respect for rights of the human person, seating at the centre of these intersections, is enhanced or hampered by how much progress is made in each pillar. In this connection, with the dawn of peace in the Horn of Africa, Eritreans are joyous and filled with a strong sense of optimism, deservedly so, after enduring and overcoming decades of adversity through resilience. The mindset and the resources that were devoted and diverted, justifiably, to maintain peace and security for several decades, will now be re-directed to other vital sectors to accelerate socio-economic progress, consolidate the rule of law and strengthen national institutions. We are determined to accelerate our efforts to create a country where peace, justice, and democracy prevail. A modern and dynamic nation anchored on equitable development, social justice, and harmony. The leaders of the region are joining hands and redoubling their efforts to develop a shared vision and strategy to make up for lost opportunities. This is a remarkable watershed in the region. The international community has welcomed the new developments as significant and historic. What is needed from the wider international community is encouragement and solidarity for the region to sustain peace and meet the aspirations of its people. The negative impact of the sanctions on the full enjoyment of human rights of the Eritrean people cannot be underestimated. It harms meaningful regional cooperation and economic integration. Consequently, countries in the region, members of the Council as well as the Secretary-General of the UN are adding their voices to the call for the lifting of the sanctions on Eritrea. The region views it as a hurdle that ought to be removed immediately to promote peace, stability, and prosperity. In this regard, my delegation wishes to take this opportunity to once again call on the international community and the Security Council to bring an end to the unjustified sanctions; thereby, demonstrating to the people of the Horn of Africa that they ready to accompany them on their progress. The UPR is the best tool to address human rights in all countries in a constructive manner. In full consideration to the UPR mechanism, Eritrea has submitted its third periodic report to the Human Rights Council, detailing achievements, challenges and the hard work ahead to attain higher standards in respect of human rights and fundamental freedoms. Out of the 92 recommendations that Eritrea accepted during its second cycle, 80 recommendations (85.87%) are fully implemented, and 12 recommendations (14.13%) are partially implemented. Additionally, Eritrea is presenting its Voluntary National Report to the UN High-Level Political Forum in 2019 to share the policies in place and the commitment needed in the implementation of the Sustainable Development Goals, including SDG 16 which covers, the promotion of peace, access to justice and the development of effective and accountable institutions. Before I conclude my brief remarks, let me extend my delegation’s profound appreciation to all the countries that placed trust and confidence on Eritrea to serve in the Human Rights Council for three years, beginning January 2019. Eritrea is committed to fulfilling its responsibility to the fullest during its mandate. It will endeavor to strengthen dialogue and consultation and to establish a balanced and inclusive approach to all issues and situations to advance the human rights agenda of the Human Rights Council.